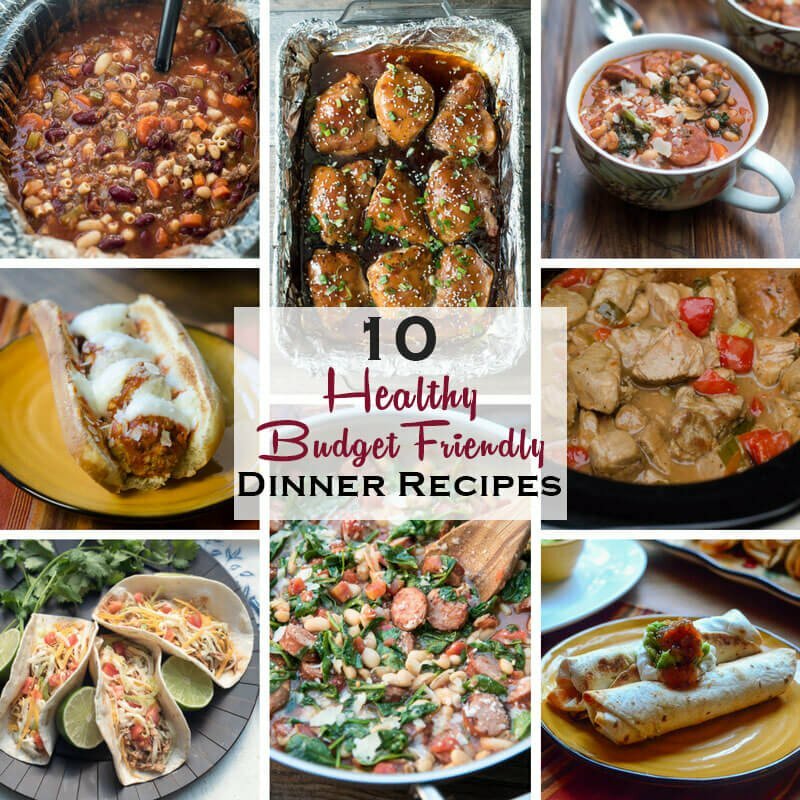 A collection of familiar, comforting meals that are wholesome options and relatively inexpensive to prepare. These 10 Healthy Dinner Recipes will help you get back on track after the holidays. It’s January which means you may be noticing the result of the not-so-figure-friendly foods that have made their way into our homes over the past couple of months. I know that I am. In addition to the holiday food bonanza, I spent more time than usual on the couch watching Home Alone, Love Actually, and Elf for the zillionth time. I’m definitely feeling the need to lighten things up. Are you with me? January is also a time when I pay more attention to how much I’m spending at the grocery store. We feed a lot of people in this house through November and December and the same balance that applies to our diet must also apply to our bank account. Not to mention that the December credit card bill has arrived (ouch). I’m not a resolution maker when it comes to what I eat because I just don’t think it works. However, I do always make some strategic adjustments in January to balance out all the holiday feasting. Since I refuse to give up flavor or the comforting, stick-to-your-ribs foods we crave through the winter months, my go-to recipes for this time of year include many of those familiar comfort foods we all love, but with a few simple changes to make them leaner and more wholesome. They also happen to be quite budget-friendly. Here are 10 of my favorites. 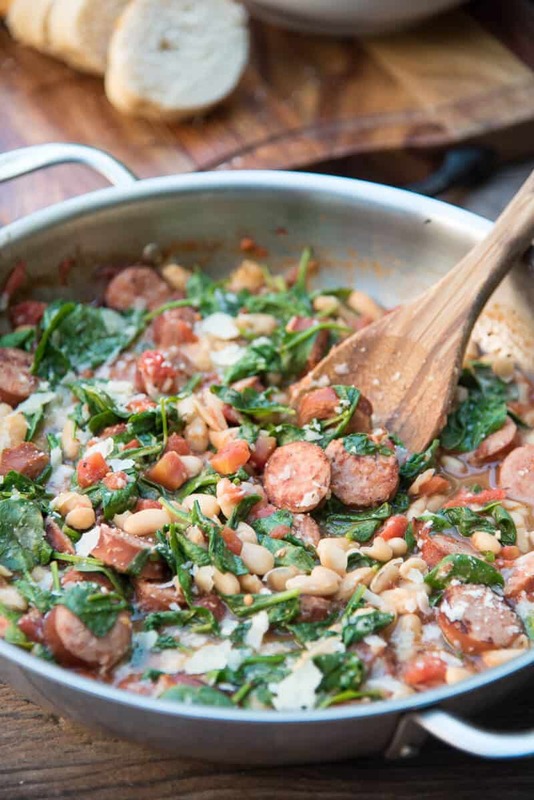 Skillet Sausage and White Beans with SpinachWhite beans, spinach, and diced tomatoes add a ton of nutrition to this dish. Feel free to substitute turkey or chicken sausage and low-sodium tomatoes to up the health factor even more. 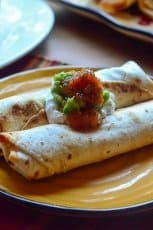 Crock-Pot Chicken TacosMexican food gets a bad rap for being heavy, cheesy, and bad for us but this recipe proves you can indeed go light with this cuisine. Lightly toast your tortillas in a dry skillet and top your tacos with lots of chopped fresh or sautéed veggies for added nutritional value. Fresh corn salsa, sautéed zucchini and mushrooms, and avocado are all fabulous choices. 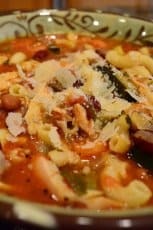 Slow Cooker Hamburger MinestroneThe addition of lean ground beef and ditalini pasta make this soup hearty enough to satisfy even the biggest appetites. 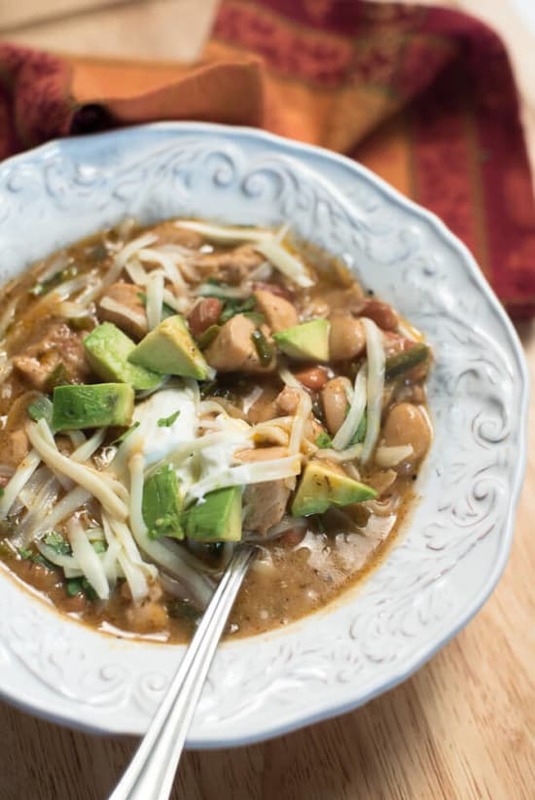 It is loaded with fiber from the veggies and beans. If you want to make it super lean and mean, it would be delicious with lean ground turkey. 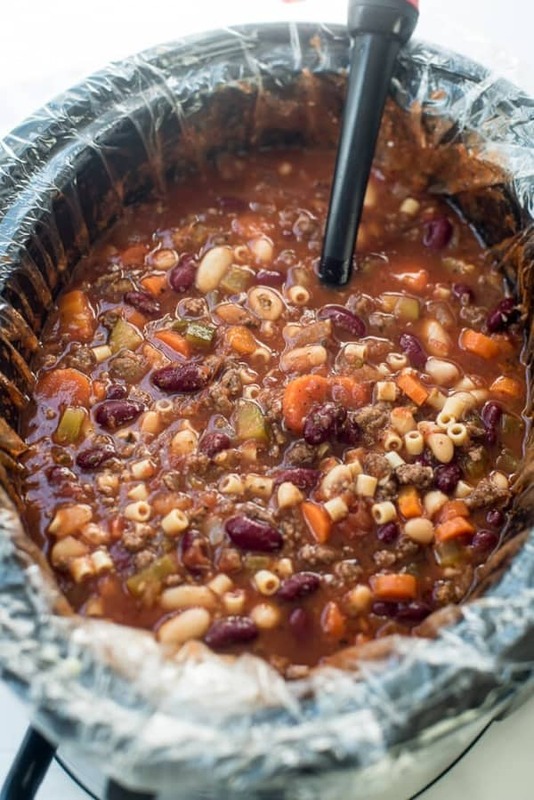 Three Bean Turkey ChiliI think I’ve made this chili 8,924 times… or so. It is one of the most frequently requested meals in my house and one of the very first recipes posted here (and in dire need of new photos which I promise will come soon). I can’t say enough about it. Try it. It is fabulous. 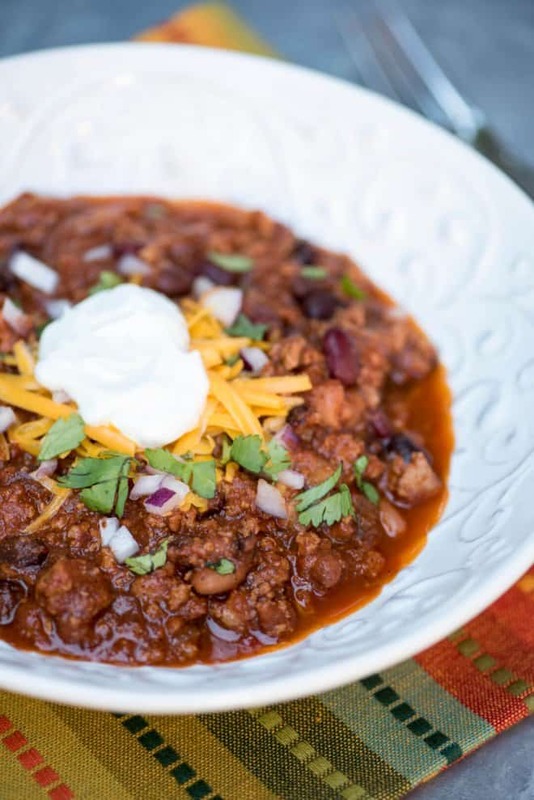 My boys love this chili more than any beef chili they’ve tried. Baked Chicken TeriyakiSkinless chicken pieces of your choice are baked with a scrumptious homemade sauce. 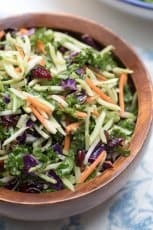 Serve it with steamed veggies and white or brown rice. This is a super family-friendly meal. Delicious! White Chicken ChiliLean chicken, peppers, a chicken broth base, and a delicious blend of seasonings. Hearty, wholesome, and delicious. 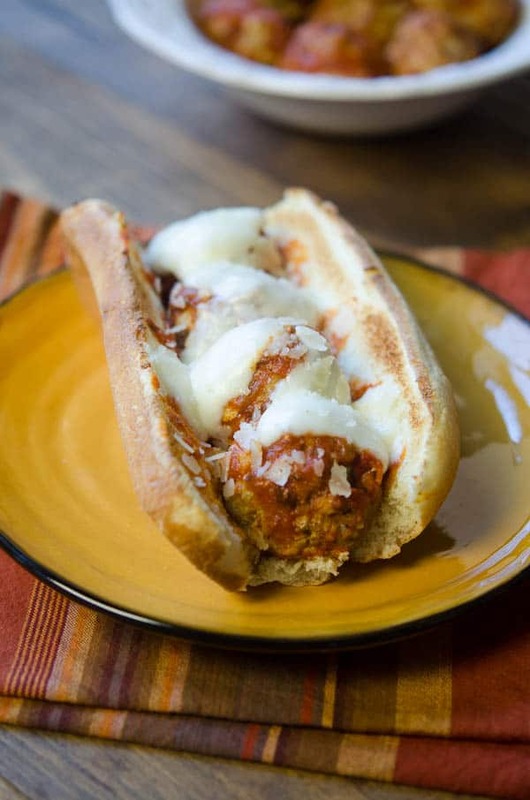 Italian Turkey Meatball SubsTotally luscious from-scratch turkey meatballs and jarred marinara sauce create these tasty subs. Great lightened up game day grub. 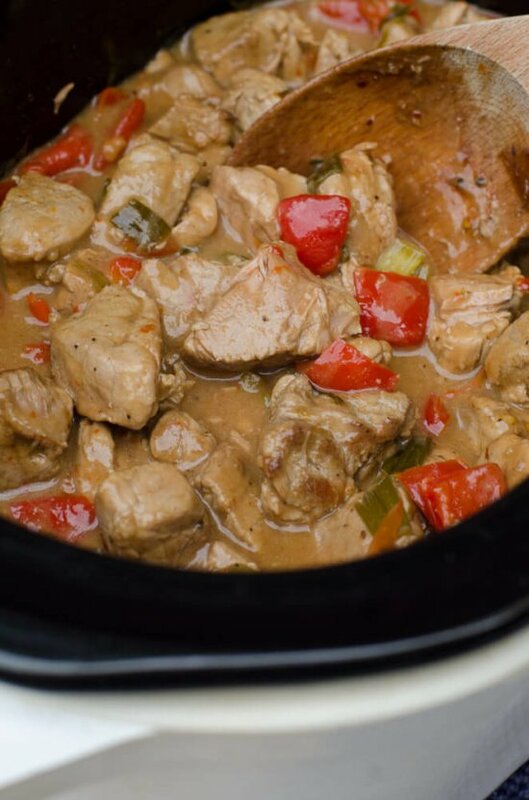 Slow Cooker Caribbean PorkThere are so many things to love about this recipe. The ingredient list includes lean pork, vibrant veggies, and a sauce that packs an amazing flavor profile. 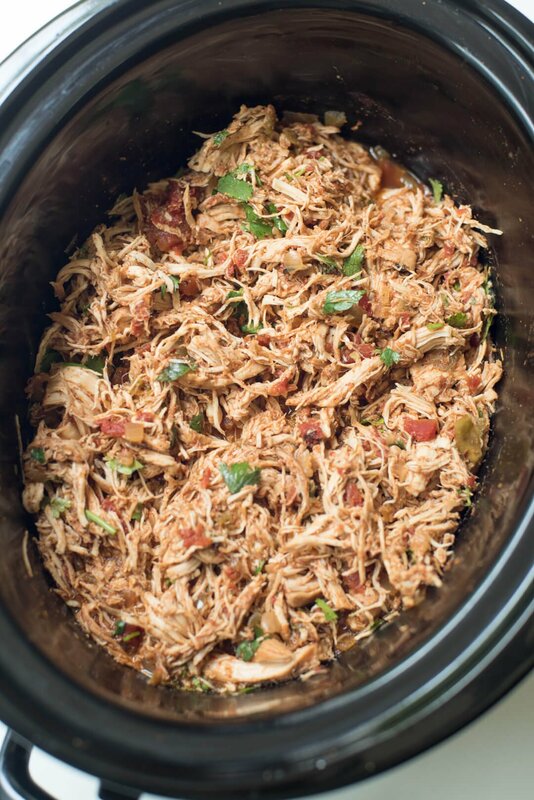 And, it is a slow cooker recipe which is a huge bonus in my book. 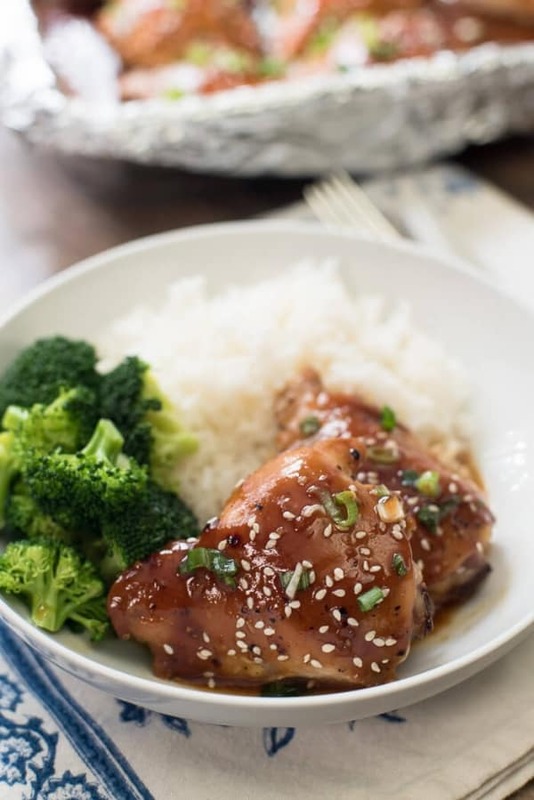 Serve over white or brown rice for a delicious meal. 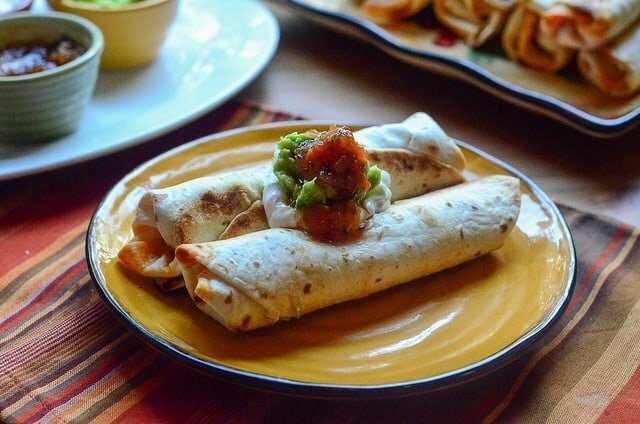 Baked Chicken TaquitosA no oil oven “fry” method and lean chicken means that these crispy, delicious taquitos are clean and easy to prepare and can be consumed with far less guilt than the traditional fried variety. Another great choice for game day or any old night of the week. My boys love these! Sausage White Bean and Kale StewIf you want to make me really, really happy, just give me a meal that includes greens and beans! This rustic, comforting stew just does it for me. Use any type of lean sausage you love for truly wholesome and delicious meal. All of these recipes look amazing! Seriously…all of them! 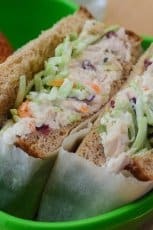 I’m making my grocery list right now and planning my dinners for the week and I’m making my dinner plans with these recipes! I’m definitely including the slow cooker recipes for nights when I’m out picking up my daughter from after-school activities right at dinnertime. We can get home and dinner is done! I’ve been looking for some new recipes to add to my repertoire. I usually get my recipes from Allrecipes, however, I thought to check Pinterest this time. Thank you for providing these! Follow up to my previous message…went grocery shopping and included ingredients on my list to make 5 of these dinners this week! 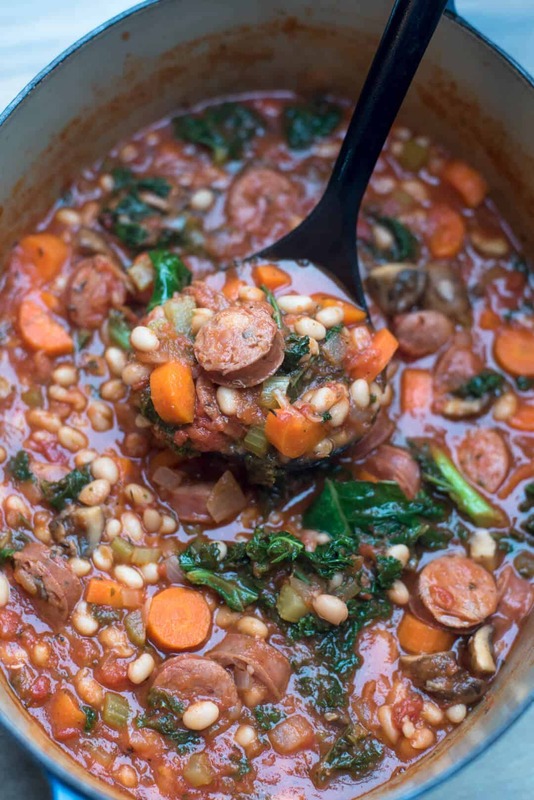 Last night we had the Skillet Sausage and White Beans with Spinach dinner and it was a big hit with my husband and teenage daughter (my son in college would have loved it too!). We decided that this recipe goes into the rotation! Thanks again!